I should be more jaded but I can’t freaking believe that Hugh Jackman and Scarlett Johansson are downstairs right now filming a scene for "The Prestige" in our living room. Christian Bale and Michael Caine are down there as well waiting for the next scene. Our house is a tavern in one scene and the interior of the Greenroom Drinking Club in another. There are also 10 bar wenches, 3 bar maids, 2 bartenders, and 30 bar patrons dressed in period garb and sitting in our dining room and library which are in the background of the shot. When they were walking down the street from their holding area on the corner they looked like a group of refugees leaving Anatevka. Everyone is smoking and between that, the smoke machine, and the gas lights they’ve installed I’m waiting for our house to go up like a powder keg. I’ve been trying to snap some decent photos but I’m far too timid—my career as a photojournalist in war-torn countries will never work. 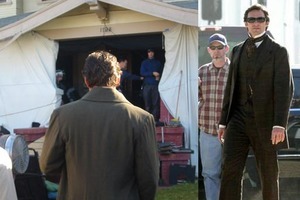 Here’s a photo of Hugh Jackman walking into our house. Scarlett Johansson was led in under a huge umbrella and I didn’t get my camera out in time. Director Christopher Nolan is sitting in our breakfast room. I think I saw his wife, Emma Thomas, who is also the producer on the film, and their new baby. Nolan directed "Memento" which I loved and "Batman Begins." He was supposed to direct a big film about Howard Hughes that he wrote which would have starred Jim Carrey but Scorsese beat him to the punch. Hugh Jackman has TWO more films as Wolverine coming up. He's also slated to play a 1930s literature professor in Germany who ends up working at Auschwitz. That film has my name on it. The entire crew just burst into laughter at Jackman’s line reading. They gave me a copy of the sides and for the whole day Scarlett Johansson and Michael Caine only have three lines each, darn it. I better not reveal too much about the story but I’ll just say that Johansson’s last line is “He’s an out of-work actor—of course he’s out of his mind!” Did you know that she has a twin brother in real life? And that she's only 22? She is so hot right now—this film is one of SEVEN that she's got lined up including the lead in "The Nanny Diaries," "The Black Dahlia" and a Neil Jordan film about Lucrezia Borgia co-starring Colin Farrell. She's also already made another Woody Allen movie in London also with Hugh Jackman and Woody himself. Is any other young actress in Hollywood getting work these days? I can’t believe all the trouble they go to for two very short scenes in a movie. And all the expense to completely transform our house. Tomorrow they will come at 6 am to start transforming it back. We may be able to keep the gigantic bar that they built in the middle of our living room and I'm going to start drinking heavily so we can make good use of it! 2:30 pm: Just had the largest lunch I've had in years. If I worked on a film crew I would weigh 400 lbs. Scarlett Johansson and Michael Caine came to the regular catering tent and couldn't be nicer. Johansson is hauntingly beautiful in her period costume. Even I have too much decency to take a photo of her while she's eating so here she is getting out of a car in front of our house. All my photos are of the backs of people which is just as well since I'm sure I'm not supposed to be taking them, much less posting them for the world to see. We watched a few scenes being shot and, as anyone who's ever worked on a film knows, it's sloooooooow going. How do they remember where their characters are emotionally when they shoot in such a disparate, piecemeal way? I really admire their skills but if I were an actor I think I'd prefer working in the theatre. Another thing that amazes me on a film set is how quiet the scene is as it's being shot. I was standing right there and could barely hear Hugh Jackman. And yet everything is so loud and forceful when you see it on the screen. What an industry. Grueling work, but looks like so much fun. Is my life meaningless because I'm not a movie star? Because they all have such well balanced and happy lives, right? Director Christopher Nolan seems like a great guy and he looks like a movie star himself. There's a huge light set up right outside my office door. I think I'm trapped. you have so much fun danny miller! okay, Danny, I wrote about my brush with fame yesterday...but this is waaaaaaay better...keep snapping away and keep your fire extinguisher handy! Tell Hugh, I love him. And the strangest part and maybe the worst part is: These scenes may end up on the cutting room floor! And when you think of what each day costs a film shoot..it's overwhelming awesome! I hope we get to see the scenes! And I hope you get to keep the bar, too! Wouldn't that be cool? Are you sleeping there in the house at night? Or is it all too disruptive? Well, I can't wait to hear about it. Danny, did you register your home with a location-scouting agency? It's exciting, and pay-worthy, I'm sure. But is the upheaval worth it? Do you get to be put up at the Beverly Hills Hilton so something on par with that? A friend in Toronto had her family home "transformed" for a Christmas movie--fake snow and all. Her family had to keep all the Judaica hidden. Wouldn't have worked in a Christmas film! That's a dream come true!!!!! Do you guys get your names in the credits? Is this a multiple-day shoot? Am fainting, gasping on the floor with envy and delight. The photos are splendid. Just as they should be for such an occassion. Next time invite all your blogger buddies - we can hide out in the bathrooms and peek every now and again like impish elves - *virtually* not there ... hm ... come to think of it, I guess you did invite us already ... with these posts. The studio folks are almost finished returning our house to normal...and we didn't get to keep the bar, darn it! 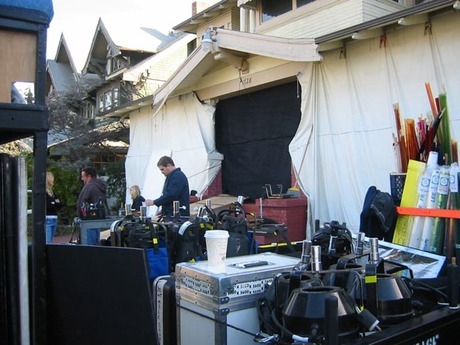 It was just a one-day shoot and we got to stay there but sometimes people have to move out. I'm hoping we can get more gigs (preferably a TV series) but it's just like being an actor: you have a lot of people coming to look at your house and sounding very positive and then you often never hear from them again. But we've been pretty lucky so I can't complain even though I'm kicking myself for not taking more photos. There were so many great photo ops of the costumed extras lounging all over our property. Oops, I mean "background artists," that's what they prefer to be called. Surprise of the year: "Johansson is hauntingly beautiful in her period costume." Take ten deep, slow breaths, Danny. This is SO FREAKIN COOL. How did you get this gig. Oh, and just because I live in Wisconsin, doesn't mean I don't get to hobknob with the rich and famous. I once passed Phil Rizzuto in the airport. You know, I bet they would take you up on the offer to return the money they are paying you for using the house in exchange for a love scene with Ms. Johansson in the movie. I adore Michael Caine. He's such a regular working-class guy.